His nephew Thomas was the first occupant. Following a major fire in 1879 the house was rebuilt with care and superb workmanship, largely to the original design. After the death of the 2nd Earl Feversham in World War I when his ten year old son Charles inherited the title, the house was let as a girls' boarding school for 60 years. Since 1986 Lord and Lady Feversham have undertaken extensive restoration of the buildings and the interiors, employing the finest craftsmen to create a home here again for their family, direct descendants of Sir Thomas Duncombe. Visitors comment on the 'grand yet homely' atmosphere. 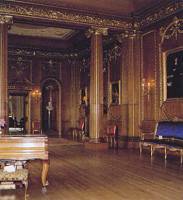 The family pictures and Lord Feversham's collection of English and Continental furniture are on show and the principal rooms remain a fine example of the type of 'grand interior' popular at the turn of the century. The early 18th century green gardens of 35 acres (14ha) have been described as 'the supreme masterpiece of the art of the landscape gardener'. Peace and tranquillity reign supreme in this classical English setting - a rare survivor of a style of gardening using the natural landscape. Explore at leisure the great lawn and level terraces, temples, yew tree walk, woodland walks and the scented 'secret garden' around the old conservatory. There are fine views of the valley 180 feet below and the distant moors. Half the 450 acres (182ha) of parkland and gardens became a National Nature Reserve in 1994 to protect the mature hardwood trees which are to a large number of scarce wood- feeding beetles, and birds which feed on them. The reserve is manage with English Nature who record each tree, and over 2,000 oak, beech, lime and field maple saplings have been planted during the last 10 years creating a haven for wildlife. The reserve is 'A refuge from the Wilde Woods which covered much of the country in the 16th century and most of the trees are over 250 years old. Some of England's oldest and tallest trees benefit from the protection. These great gnarled veterans with their dead and dying limbs, rot holes and hollow trunks are living treasures and part of our heritage'. There are waymarked walks, discovery trails and orienteering courses for all ages which explore the woodlands, river valley, meadows, woodland skyline and commercial forestry. In fact, its as near as you can get to that 18th century concept of Arcady - or an ideal rustic paradise.